30 Minute Skillet Chicken Stew: easy weeknight meal! 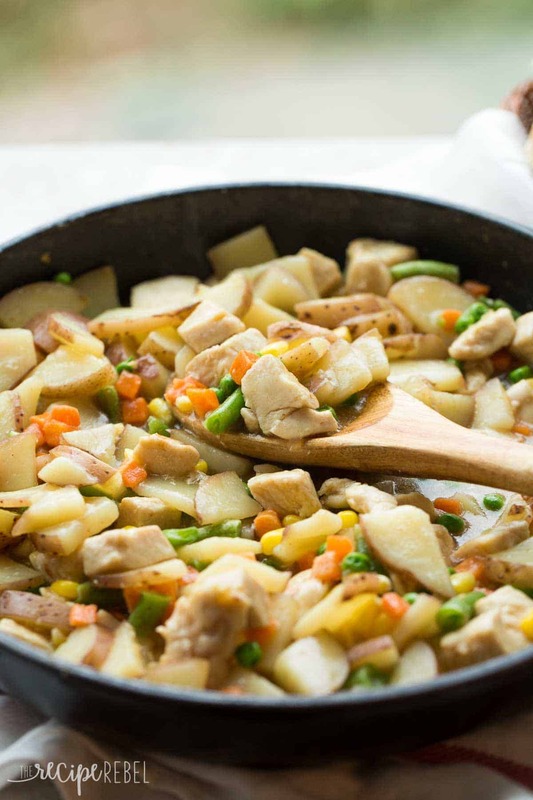 A hearty dinner in one skillet — chicken or turkey, potatoes, vegetables, and gravy in one pot and 30 minutes! 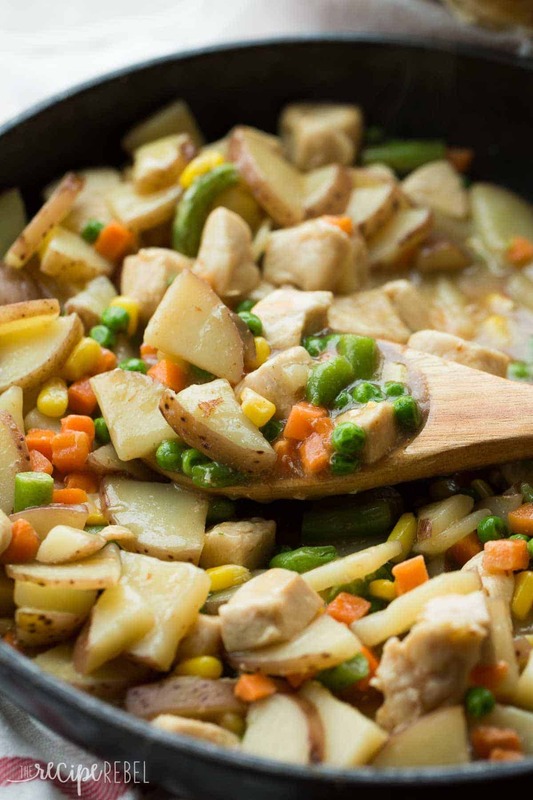 This Skillet Chicken Stew is perfect for a busy weeknight! So it’s #30MinuteThursday and I know you’re so over all of the holiday extravagance but still wanting some healthy, hearty comfort food. Stew is something I don’t make all that often, I think because it just sounds time consuming, you know? I have to admit, when I was thinking about doing this stew I wasn’t sure I could get it done in 30 minutes total. Sometimes potatoes take longer to cook than I think, and there is chopping… but what really saves time here is slicing the potatoes instead of cubing them, and using frozen vegetables. I have no problem using frozen vegetables or fruit, especially if it means that the vegetables actually get on the table at dinner time! I set the timer for 30 minutes, and started cutting my chicken. While my chicken cooked, I sliced my potatoes. And when the timer was at 7 minutes left I was stirring in my frozen veggies — success! It’s always kind of a thrill seeing what kind of a meal you can make in 30 minutes. That’s even almost enough time for me to get dinner on the table before the baby starts clinging to my legs and crying for her dinner (she does not have a lot of patience when it comes to her food!). So whether you need a warm, hearty post-tobogganing meal, or just an easy weeknight dinner for any time of year — this stew is perfect for you! 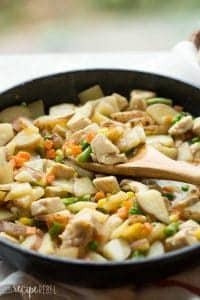 Chicken or turkey, potatoes, vegetables, and gravy in one pot and 30 minutes! 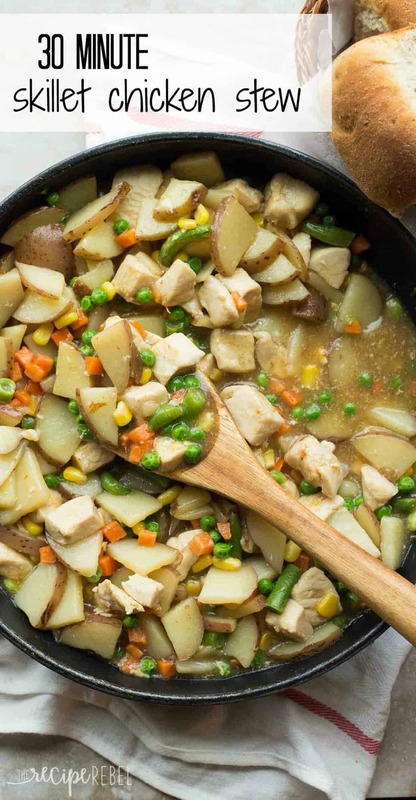 This Skillet Chicken Stew is perfect for a busy weeknight! In a large skillet, heat oil over medium high heat. Add turkey or chicken and sprinkle with seasoning salt. Cook for 4-5 minutes, stirring occasionally, until lightly browned. Add potatoes and cook for 5 minutes, stirring occasionally. Add chicken broth and bring to a boil over medium high heat. Cover and reduce to medium low heat and simmer for 8-10 minutes or until potatoes are tender. Combine corn starch and water and stir into skillet. Add vegetables, cover and simmer over low heat until vegetables are warmed through, 3-5 minutes. Salt and pepper to taste. Serve with some bread or rolls for dipping! So when it says serving size 1/4. So 278 calories is only from 1/4 of a cup???? 278 calories is for 1/4 of the recipe. The recipe serves 4. Haha all my kiddos and my husband are not patient when it comes to waiting for their dinner either. This chicken stew looks SO comforting and delicious! 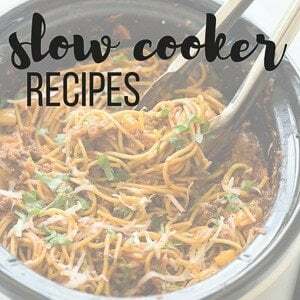 Perfect for this rainy day we’re having here and I love that it’s ready in 30 minutes! I cant believe this is ready in 30 minutes! Just my kind of dinner! This stew looks delicious and just like something my family would love! I can’t believe this was done in 30 minutes!! It looks so deliciously hearty and rich – absolutely perfect for these dreary winter days. Gotta try this! Yum! It’s like chicken pot pie without the pie! Which is perfect since we could all use a little less carb-age this time of year. 🙂 Love it! Oooh I never really thought a stew recipe could be done in 30 minutes. This is amazing! 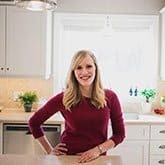 Every month I just want to plan my weeknight meals around these 30 minute Thursday recipes. I want them all!! I love this! I’m learning so much with these 30 Minute Thursdays- your trick about slicing the potatoes is so smart! I am definitely putting this chicken stew on my menu plan soon! I never make stew either, because it feels like it would take forever! Clearly I need to try this version soon. It looks amazing! Stews and soups totally DO sound time consuming. Growing up, they were always something my mom cooked for like 6 hours on a Sunday afternoon/evening. But it SO doesn’t have to be that way! 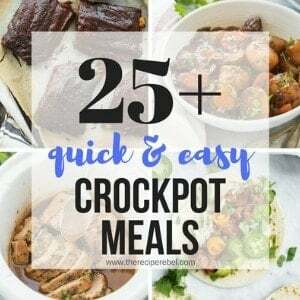 I’ve been getting better at making “fast” stews and soups this year and now I can add this recipe to my arsenal! Yeah! Hey, you could call it 25 minute Thursday and use leftover rotisserie chicken. 😉 NAH!!! That doesn’t have the same ring to it. Plus you’d miss all that flavor from sauteing the chicken in the same pan. I love how you race against the clock to get dinner on the table. Cooking is a sport! There’s nothing more comforting than stew, and having it in 30 minutes is the best! This looks so healthy and delicious! Thanks Marcie! It is a great winter meal! My “baby” is a teen and sometimes even she doesn’t have patience for her food! but this would work well – awesome recipe Thanks so much for sharing it! Yes! I totally agree! I think they are so great to have on hand, and it’s one of the things you really don’t lose the quality of when you buy frozen. This week has been very very busy and Clayton and I were just saying it was time for a REAL dinner! I love how loaded this is with delicious veggies and big tender chunks of chicken! Yum! Really?! Crazy! We are having such a mild winter here it’s kind of unbelievable. Oh well — I’ll take it! Thanks Sarah! I’m loving 30 minute Thursdays! This chicken stew looks SO good, Ashley! I love that it’s so easy to make and packed with veggies in here. Perfect for my husband that is picky about what he eats! Sounds delish! 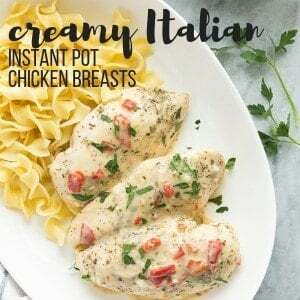 Hit both share Pinterest buttons, yet cannot post the recipe. Hi Susan — I’m so sorry to hear you’re having problems! Are you on a mobile phone or tablet? I seem to have more problems with those share buttons than on the computer. I am on my home computer. I love this stew, Ashley! It looks so comforting and delicious and it definitely looks more labor-intensive than it actually is. Frozen veggies can be such a dinner-saver!